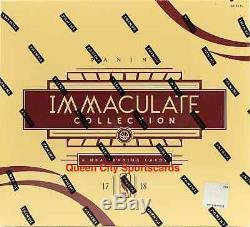 2017/18 Panini Immaculate Basketball Factory Sealed Hobby 5 Box Case. Thank you from Queen City Sportscards. Configuration: 5 boxes per case. PRODUCT HIGHLIGHTS - Immaculate features the widest array of unique memorabilia! Look for jumbo patches from players jersey number, team logo and nameplate! New in 2017-18 - pull cards that feature the jerseys Brand Logo and Team Slogans! - Find a variety of sneaker cards! Pull massive Sneak Peek cards with whole heel logos, brand logos, tongue logos and shoelaces! - Look for the return of iconic Rookie Patch Autographs and Patch Autographs with Jersey Number variations! - Chase dual, triple and quad autographs that showcase unique and classic groupings of rookies, stars and legends! - Dual Rookie Logoman Autographs return with pairings from the star-studded 2017-18 NBA rookie class! BOX BREAK - 5 Autographs/Memorabilia Cards. PATCH AUTOGRAPHS Look for Patch Autographs and Rookie Patch Autographs of the games best and brightest! PATCHES Find both oversized and unique memorabilia swatches from all parts of the jersey! LOGOMAN A staple of the Immaculate brand, chase down Logoman Autographs from the top rookies and stars of the NBA, including rare Dual Rookie Logoman Autographs! If you do not receive the per box hits described above, you must directly contact Panini for replacements, as there is nothing I can do once the case has been opened. Please contact me for any additional information or photos. The item "2017/18 Panini Immaculate Basketball Factory Sealed Hobby 5 Box Case" is in sale since Sunday, November 11, 2018. This item is in the category "Sports Mem, Cards & Fan Shop\Sports Trading Cards\Basketball Cards". The seller is "qcsportscardsnet" and is located in Charlotte, North Carolina. This item can be shipped to United States, United Kingdom, Denmark, Romania, Slovakia, Bulgaria, Czech republic, Finland, Hungary, Latvia, Lithuania, Malta, Estonia, Australia, Greece, Portugal, Cyprus, Slovenia, Japan, Sweden, South Korea, Indonesia, South africa, Thailand, Belgium, France, Hong Kong, Ireland, Netherlands, Poland, Spain, Italy, Germany, Austria, Bahamas, Israel, Mexico, New Zealand, Singapore, Switzerland, Norway, Saudi arabia, United arab emirates, Qatar, Bahrain, Croatia, Malaysia, Brazil, Panama, Jamaica, Barbados, Bangladesh, Bermuda, Brunei darussalam, Bolivia, Ecuador, Egypt, French guiana, Guernsey, Gibraltar, Guadeloupe, Iceland, Jersey, Jordan, Cambodia, Cayman islands, Liechtenstein, Sri lanka, Luxembourg, Monaco, Macao, Martinique, Maldives, Nicaragua, Oman, Peru, Pakistan, Paraguay, Reunion, Viet nam.